Today’s card always makes me smile – the Wren is one of my spirit guides. This king of birds here reminds us that we are bigger and more powerful than we think. FYI, the Cow was also strong today, and it represents nourishment, motherhood, and the Goddess. 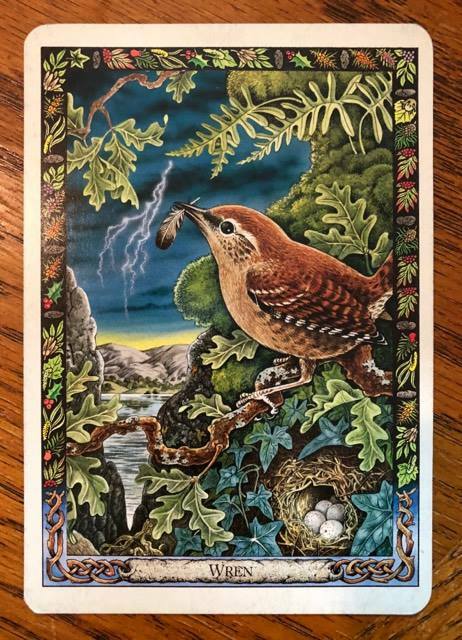 The card shows a wren holding a feather in its beak, as it guards its nest filled with eggs. Tradition calls the wren’s nest the “Druid’s House.” A bolt of lighting represents Taranis, the bull-god of thunder and lightning, the oak tree, and the wren. The Ogham sign in the stone is of Duir, the oak. Meaning: Wren allows us to glimpse the beauty of God or Goddess in all things. He tells us that “small is beautiful,” and that self-realization lies not in grandiosity or apparent power, but in humility, gentleness, and subtlety. Cunning, if tempered with humor and good intent, is a way of achieving great things with an economy of effort, and a rational and honest use of the achievements of others. On the flip side, this card could mean that you need to look at whether your humility and gentleness actually render you invisible to others. Are they your way of defending yourself from life and from others, rather than facing life and its difficulties? Perhaps you also need to look at how you use your cunning, your native wit. It is easy for the habit of building on the work of others to become dishonest exploitation of others’ achievements, just as it is easy for the cunning to become malign rather than benign. Remember that the story of the wren and the eagle can also be interpreted in a way that sees the wren as a cheeky and dishonest “upstart” who naively believes he can fool others and win status for himself through his ruse. Cleverness and building on the work of others require wisdom and honest skill if they are to be of value.